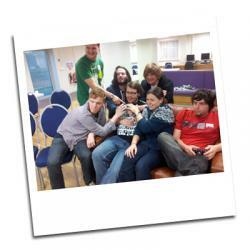 Students from the Bangor University Gaming League are preparing for a marathon 72 hour gaming session on Friday 25 January, to raise money for children’s charity Child’s Play. Around 30 people are expected to take part in the marathon, which will be held in the Alaw Common Room on the Ffriddoedd site. Those wishing to follow the action online can watch live streaming via www.twitch.tv/bugl. Members of the Bangor University Gaming LeagueThe society’s Gear Manager Adam Sharpley, one of the organizers of the event said, “The Bangor University Gaming League is a society which has a weekly meeting where members get together and play video games, and we also organize online sessions. Staying awake for the full 72 hour session is the biggest challenge facing those taking part in the marathon, but there is also an option for members to play for a few hours over the course of the three days. Adam explained, “The biggest difficulty for those involved is going to be dealing with sleep deprivation if they attempt a long stint. Sleep deprivation can cause a lot of problems such as affecting mood and physical problems such as fatigue. “The Gaming League president, James West, has completed a 72 hour session before and most of us on the committee seem to be insomniacs! That being said, 72 hours is going to be very challenging and we have made all of our members aware of any health risks involved and advised them to take regular breaks if they do decide to attempt the full three day session. “Most of our members have planned to do a few hours here and there, or maybe a full day. Some people have exams and lectures so we don’t expect anyone to force themselves to stay awake. Adam added, “We would like to thank everyone who is taking part, volunteered to be on the live stream or help in some way and all those who have donated so far. If people are not interested in watching us play games, there will be other things on the live stream such as members doing the cinnamon challenge.